I had a lovely patient yesterday who came to her appointment with her 4 year old daughter. As our meeting came to a close her daughter announced that she would like ' some of those foods that stick to your teeth, please mummy'. My client gasped and uttered 'what a thing to say in front of the dietitian!!'. This was followed promptly by 'I need to have a python 'cause I have forgotten what it tastes like!'. I reassured my client that yes, children do listen to what you say and you have to be clear from the outset. They may not understand the negatives of things sticking to your teeth however they know that foods such as these are not everyday foods. I think this is where we as parents make it difficult for ourselves by not isolating non core foods and foods that have empty kilojoules away from everyday foods. Pester power is huge however we just have to stay strong. As you know we have treat Tuesday which gives me some breathing space for the rest of the week. 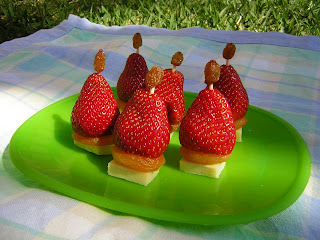 provide good food that looks great - the fruit picks above went down a treat at a gathering. Elevate their main meals above dessert for example: If you eat all your good food on you plate then you can have something that is not so healthy (parents make the mistake of saying if you eat dinner ...you can have dessert- kids look at mums face when it lights up at the word dessert!! !...look excited when you say 'all the good food on your plate'! Tough times coming up during the Christmas break....set 'treat' goals and stick to them! !